By now, just about everybody who closely follows the news should have heard of “Climategate”, the leaking or hacking of emails and other files from the servers of the Climatic Research Unit (CRU) at the University of East Anglia, the main center for climate research in the United Kingdom, and the main keeper of the faith (and the data) for the Intergovernmental Panel on Climate Change (IPCC). I say “should have” because, so far, the establishment media in the United States have shown about as much interest in this scandal as they did in the ACORN scandal a few months back. Which is, to say, none. This is no doubt because the files reveal what, to the media, must be a very inconvenient truth: namely that, since the late 1990s, some of the biggest names in climate science have engaged in fraud, deception, intimidation, harassment, coverup, and manipulation of the peer-review process in a determined effort to push their alarmist global warming agenda and destroy the careers of those who dare to question their conclusions or criticize their research methods. Had it not been for the so-called alternative media — the blogosphere, talk radio, Fox News, etc. — we would still be in the dark about this story. CRU and other climate scientists who support the anthropogenic global warming (AGW) hypothesis have been “cooking the data”, modifying it as necessary to produce the results they are looking for. Evidence of this was found, not just in the emails (“I’ve just completed Mike’s Nature trick of adding in the real temps to each series for the last 20 years (ie from 1981 onwards) and from 1961 for Keith’s to hide the decline.”), but in computer code and programmer’s notes that were also taken from CRU’s servers. They have hijacked the peer-review process and have forced out editors of journals that published articles that did not toe the AGW line, and have conspired to keep dissenting views out of journals and reports (“I can’t see either of these papers being in the next IPCC report. Kevin and I will keep them out somehow — even if we have to redefine what the peer-review literature is!”). They have conspired to keep their data and computer codes away from other scientists who have questioned their research (“If they ever hear there is a Freedom of Information Act now in the UK, I think I’ll delete the file rather than send to anyone.”) When the University of East Anglia finally did release the data — after the scandal became public — it turned out that the original raw data had been “lost”. Nothing in the e-mails undermines the scientific case that global warming is real — or that human activities are almost certainly the cause. Oh, yes it does. It is ironic that it is Nature that is saying this, because that is the journal where it all started. To understand why Climategate undermines the case for anthropogenic global warming, think back about a dozen years to the 1990s. There was a lot of buzz back then about global warming, just as there is today, but what alarmists later claimed was a “consensus” on AGW had not yet formed. That’s because scientists who were pushing the AGW hypothesis were basing their case on computer simulations. Skeptics pointed out that the simulations were sensitive to the assumptions made by the modelers and that there was no real evidence that the earth was actually warming up very much as a result of human activity. In 1998, the journal Nature provided the “evidence” in the form of an article by Michael E. Mann and two collaborators (R. S. Bradley and M. K. Hughes) who, using tree ring and recent instrumental data, purported to demonstrate that, around 1910, global temperatures started to shoot sharply upward after centuries of stability or slight decline. The explanation offered for this abrupt change in the temperature trends was the large increase in the quantity of greenhouse gases emitted as a result of human activity. A graph illustrating this was prominently featured in the IPCC report Climate Change 2001 and became known as the “Hockey Stick” because of its shape. The main result of this — in addition to the boost it gave to Mann’s career, rocketing him from a lowly adjunct assistant professorship to the top of his profession — was that global warming alarmists started making claims that the science is “settled”, that “the debate is over” and we must act NOW. But the debate was far from over. There were serious problems with the hockey stick, not the least of which is that it failed to show the Medieval Warm Period and the subsequent Little Ice Age. The “Hockey Team”, as the Mann supporters now styled themselves, asserted that the these were localized phenomena. However, a paper by a pair of Harvard-Smithsonian astrophysicists, Sallie Baliunas and Willie Soon, surveyed the studies that had been done and concluded that the MWP and LIA were real and global in scope. This led to Mann’s now-infamous email calling for a boycott of the journal that published the Soon-Baliunas paper, the subsequent resignation of three Hockey Team supporters from the journal’s editorial board and, eventually, the firing of the editor. Far more serious were problems found in the methods Mann used in deriving the Hockey Stick. Steve McIntyre, a retired Canadian metallurgist who is well-trained in statistics, asked Mann for the raw data and the computer code he used to analyze it. After a lot of stonewalling and delays, Mann provided most of the data and the algorithms he used. 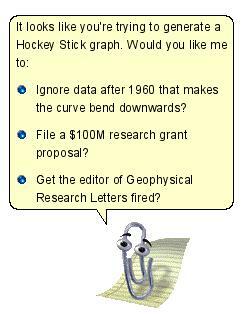 McIntyre and econometrician Ross McKitrick found that Mann had used a data-mining algorithm that seemed designed to select only those data sets that would produce a hockey-stick shape when graphed. To test Mann’s algorithm, McKitrick and McIntyre created a random sequence of data that consisted of “trendless random noise, simulating the data you’d get from trees in a climate that is only subject to random fluctuations with no warming trend”. (See McKitrick, 2005). In 10,000 repetitions on such random sequences (called “red noise”), a conventional principal components algorithm hardly ever yielded a hockey-stick shape — as would be expected of a statistically unbiased procedure. But when the Mann algorithm was applied to the red noise, hockey sticks resulted 99 percent of the time — a clear indication that he had used a biased (in a statistical sense) procedure. McKitrick and McIntyre wrote a letter to Nature pointing out the flaws in the Mann paper. After an eight-month delay, the journal’s editors informed them the letter would not be published. Considering what the two Canadians’ findings implied about the quality of Nature‘s peer-review process, the editors’ reluctance to publish the letter is somewhat understandable. However, the journal did allow Mann and his co-authors to publish a correction in which they conceded the existence of some minor errors in their original paper. Even so, the authors insisted that the errors did not affect their results. Despite McKitrick and McIntyre’s dissection of the Hockey Stick, it continued to dominate discussions about climate change, and the Hockey Team, with its informal headquarters at the CRU at East Anglia University, continued to dominate the IPCC and the peer-reviewed literature. The Hockey Stick wars continued (as is evident from reading the CRU emails), and in 2006 the Committee on Energy and Commerce of the U. S. House of Representatives asked Edward J. Wegman, a George Mason University statistician, to examine the controversy and prepare a report. Wegman’s report found that the Hockey Team members were often sloppy in their use of statistics, but of far more interest is the finding of the incestuous relationship among them. In a chapter titled, “Social Network Analysis in Authorships in Temperature Reconstructions”, Wegman noted that members of the Hockey Team were in the habit of co-authoring papers with each other and reviewing each others’ work for the journals. In effect, they were peer-reviewing their own work. None of this seemed to make a difference. As recently as last summer, McIntyre caught Keith Briffa, a prominent Hockey Team member, excluding tree ring observations that did not support his attempted Hockey Stick reconstruction. Now, with the release of those emails and the computer code and comments, we have confirmation that what skeptics suspected all along is true: the global warming alarmists have been engaging in scientific fraud — a fraud made possible by our tax dollars (and pounds). British science writer Christopher Booker has termed Cimategate “the worst scientific scandal of our generation”. Any study that depends on tainted CRU and Hadley Centre (Hadley Centre is not the same as the CRU, but they share their data) data has to be discarded. Any paper that cites a study that depends on CRU-Hadley data in support of its own thesis has to be discarded. Any paper that was peer-reviewed by any of the scientists on the Hockey Team has to be re-evaluated. Any paper published in a journal controlled by the Hockey Team will have to be re-evaluated. If all these things happen, the empirical case for anthropogenic global warming vanishes or, at the very least, is severely undermined. (And, if these things don’t happen, how will we be able to trust scientists again?) In terms of our knowledge about climate change, we’re back in 1997, when all we had were the climate models. In one sense, though, the alarmists are right. Climategate doesn’t prove that humans are not contributors to global warming. But that’s like saying that just because you have learned the police framed a suspect, that doesn’t prove he’s innocent. If we are to make the personal sacrifices the alarmists are demanding of us, we need something more than a lack of proof that humans aren’t negatively affecting climate. Next week world leaders are meeting in Copenhagen to try to hammer out agreements that will require those of us in the developed world to give up many of our personal freedoms and accept a reduced standard of living, and those in the less developed world to give up their dreams of climbing out of grinding poverty. It’s one thing to make these sacrifices because of an error in judgment. It is another thing entirely to make them because of a lie.